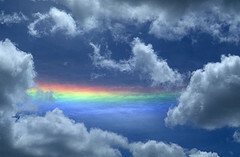 White light is a sum of all the colors of the rainbow. A prism, this pyramid-shaped piece of glass, breaks white light into many separate components. Take that rainbow of colors bursting out of the first prism and run it through a second prism to combine all those colors back to white light. 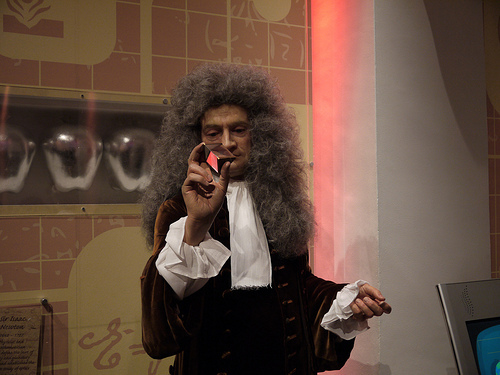 This experiment came out of the curious mind of Sir Issac Newton in the late 1600’s. The same guy that saw an apple fall from a tree and deduced the laws of gravity. Prisms have nothing to do with causing the colors. These shaped pieces of glass allow us to see exactly how a rainbow works, when droplets of moisture acting like prisms, float though the sky. Colors are actually vibrating packets of energy called wavelengths. 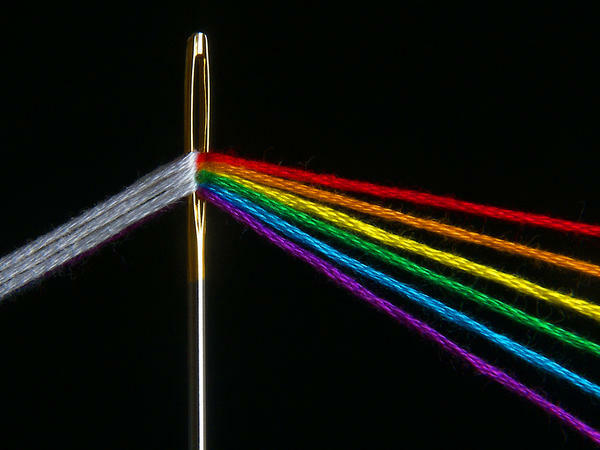 Each specific wavelength gives off a different color in the visible spectrum of light. White daylight streams down onto the rose. 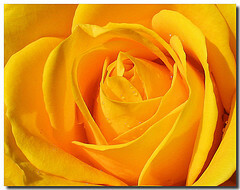 The flower absorbs every color in white light except yellow. Yellow is reflected to your eyes. This visual signal is transmitted to your brain through the optic nerve. Your brain interprets that wavelength of light as yellow. What you are seeing is your brain’s interpretation of a vibration of energy. Our brain has millions of neurons (nerve highway). It takes what comes in through the optic nerve of the eyes generating a unique energy pattern that dictate a color. Renovating Your Mind thinks that seeing in color is all about the survival of our species. With the availability of rainbow vision, humans were able to abruptly see wild fruit and greens while running through jungles. They were also better able to read faces of others for their emotions. This would give them the advantage whether it would be for love or battle. If a mate was sick there were better able to spot illness in color changes on the face and body. You could also get a better heads up on whether to use a fight or flight technique to increase chances of survival. 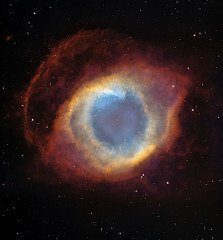 Color made vision a better protector to help ensure longevity of the human species. We are completely blind to everything except the small visible light portion. Check out the area of Ultraviolet Rays in the above chart. In a normal eye, UV light cannot penetrate into the retina and be detected by the brain. With cataract surgery, your damaged lens is replaced with a thinner substitute. This decreases the depth of the eye, allowing UV light to send its vibrating signal to the brain. Patients with replacement lens may develop the ability to see UV light. Something our species had never experienced before the invention of the intraocular replacement lens implant. When we deliver telescopes by rockets beyond Earth, we use advanced visual technology. Instrumentation is given the ability to see electromagnetic radiation invisible to humans. Mankind has designed these robotic devices to see in areas that we would only perceive as the pitch blackness of space. Eyes contain things called rods and cones. Rods are sensitive to shades of grey. They function with less light. Think night. Cones are able to distinguish colors. So they require more light which happens in the daytime. The human race is mainly trichromatic, which are the three primary colors. That means there are three different types of cones. Each one tuned into a different color. Each color cone can pick up about 100 different gradients of colors. Together, they have the ability to see about 1 million different colors. There are humans walking the face of the Earth that are tetrachromat. That means that they have four (tetra) different types of cones. Possessing an extra cone in the orange range (between green and red). gives them the unique ability to see 100 million different colors. Visually, their world is so much more color detailed than what see through our trichromatic eyes. This color advantage, mainly in women is estimated to occur in 1-3% of the population. On the opposite end of the spectrum is color blindness which appears mainly in men due to genetics. Approximately 6-10% of men are color-blind. They are endowed with the normal blue but they either have 2 red or 2 green cones. These individuals are dichromats meaning only having two (di) types of cones. This causes a problem recognizing between red and green. What are the implications of distinguishing between peppers, traffic lights, stop signs and Christmas tree illuminating decorations? There are also men that are monochromats that only have 1 type of cone. This is an extremely rare condition. They can only see about 1/3 of the colors that we see out in the world. During one of my past eye examinations, I questioned my doctor about being able to train our eyes to see better. He responded that it depended on the amount of abnormality of the eyeball. In addition, with age the muscles in your eyes weaken, normally degrading close vision (presbyopia). He told me that there was no way that eye exercises could improve vision. Guess what? That fact may have changed. An App for the iPhone called GlassesOff, focus on the visual center in your brain. Your mind’s optic (eye) center is trained by this application to better recognize fuzzy images.The program works best for adults in the 40-60 year old category. Study was completed with 30 subjects utilizing this software. It resulted in regressing age-related vision loss by an average of almost 9 years. Input to the brain from the eyes was the same but the processing of that signal was improved by these exercises. Research concluded that patients increased vision acuity by 160%. This could make a small difference for some and a large difference for others in the overall quality of the image. There is value in this program for those with lazy eye in addition to patients that use bi-focal devices for near vision. Another question that came up from my patients was about cataract formation. Is it decreased by wearing contact lenses? No, but you can protect yourself with quality sunglasses and a hat. In addition, smoking and poor diet increases the risk of cataracts. Smoking is a catalyst for cataract induction. Poor diet has much less of the protective antioxidants necessary to limit cataract formation. Cataracts are produced when the normal transparent crystalline lens becomes opaque (cloudy). Blue colors are the most damaging which is why sunglasses and a hat helps protect your vision. Don’t look directly at the sun or any eclipses without full protection. What is truly mind-boggling, is how we have adapted our visual talents handed down through genetics from hundreds of thousands of years ago. Sense of sight has increased our chances for a survival as a species. Mankind advances scientifically, because of our ability to design instrumentation for space vision. Vision that expands the electromagnetic spectrum to let us peek into mysteries of the universe. Things we would have never seen with the human eye. I believe that we are not alone in the universe. Although the homo sapiens species is special, there are also other unique beings that are just as special. Colorado has really changed your appearance. You’ve got long hair now!!! Ha Ha. Good article. Colorado has changed a lot of things for a lot of people. lol My hair is only a figment of visual imagination. Thanks for the compliment. Appreciate that!